It was a sad day. We sold our 1978 VW Rabbit. We've been going back and forth about it for quite some time now, but with the family growing it made it very hard to keep the little car. By the time we got home from selling it and mourning our loss, it was time to get a bite to eat. Since it was a bit late, I didn't want to make a big meal, but I needed something ... and quick! I had two beets in the fridge so I started roasting them as I thought about what I would do with them. 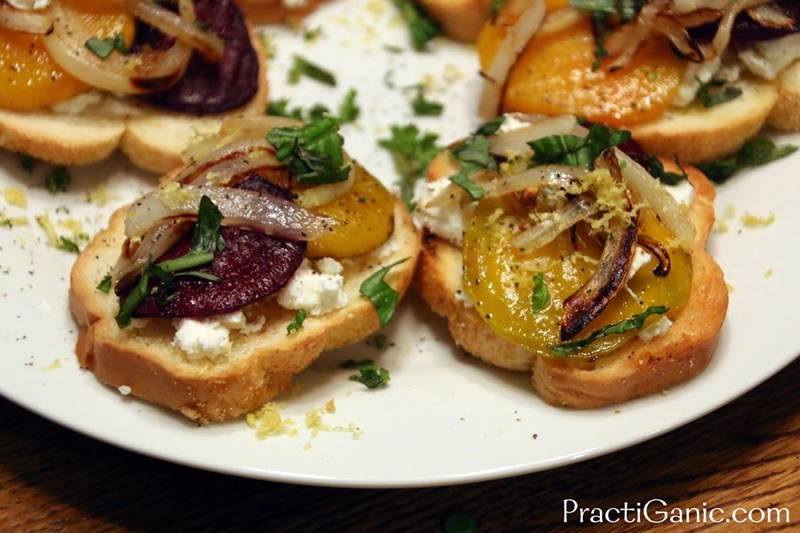 It quickly came together as Beet and Goat Cheese Bruschetta. My favorite part of this whole appetizer was the lemon zest that I sprinkled on the top of it. It goes to show, don't skip over the little touches ... sometimes those are the ones that make the food sing! The next day, I was still excited about this appetizer so I was telling my sister-in-law about it because she too is a goat cheese and caramelized onion fan. However, she just laughed at me because she thought this is the last thing that most people would make as a late night, last minute snack when they need food! What can I say though, I love the simple gourmet. Lay slices of beet on a baking sheet. Spray with oil and sprinkle with salt and pepper. Bake for 15 minutes. They should be slightly firm but golden. Next, lay slices of bread on a baking sheet. Spray with oil and sprinkle a little salt and garlic powder on them. Bake for 7 minutes. or until they are the crispiness that you like. 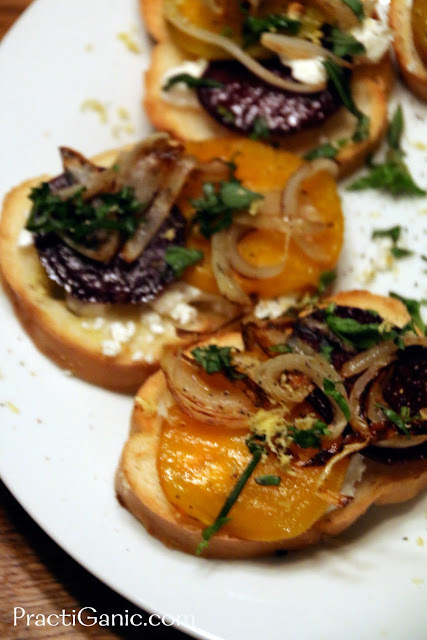 While your toast and beets are in the oven, caramelize your onions over a medium heat with enough oil to keep them moist ... about 1 T.
To assemble, spread goat cheese on bread, top with two slices of beet then a little caramelized onion. Garnish with lemon zest and basil. I am very generous with the lemon zest. The extra flavor is amazing!